OK so maybe this summer hasn’t been the best. 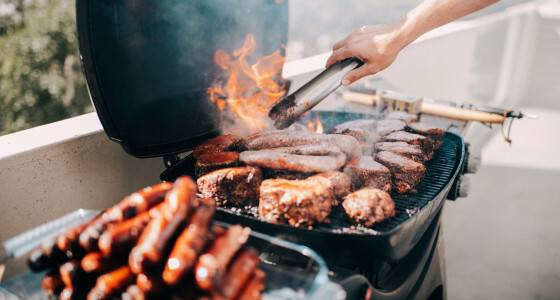 The recent chilly temperatures, hectic winds, and grey skies might have you thinking barbeque season ended back in June. But if there’s one thing us Brits are good at, it’s celebrating the British summer even when there’s not much summer to celebrate. So get your sunnies back on, keep those fingers crossed for a bright afternoon, and have yourself an epic barbie without straining your wallet. Here are our tips. Disposable barbeques are fine for one-off events or when you need portable equipment. But if you’re planning on hosting more than one barbie this summer disposables can get pricey, fast. Not only that, but a good grill will get you better flavour, and you’ll get your money’s worth because you’ll be itching to fire it up whenever the sun comes out! Today, you can get grills for as little as £15, and if you wait around for offers, you could get some really snazzy equipment for a whole lot less. If you’re not sure what type of grill to get, there’s lots of info online weighing up the pros and cons of each type. In general, barbeque fans agree that charcoal grills are the best for flavour and smokiness - and you can often get deals on charcoal too. For something really special - that will also save you a pretty penny - try making your own burgers for the grill. Good quality mince is often cheaper than pre-packaged patties and, even better, you get to show off your handmade burgers to all your mates! Recipes for patties can range from quick and easy to quick and sophisticated so DIY patties are ideal for a custom burger experience. Plus, handmade burgers makes it easier and cheaper to cater to fussy guests and guests with specific dietary preferences or needs. Everyone loves a good side dish - and your wallet will, too. Side dishes are cheaper to make (and eat!) than meat-based mains so it’s good to outnumber your burgers with some delicious and filling sides. There are lots of recipes available online to get stuck into, and plenty of price ranges to suit your budget. By making your own sides, you’ll have a more cost-effective, exciting, and creative spread than the standard junk food. Boneless meat options can seem more appealing; surely these options are more convenient, better quality, and tastier? Actually, on-the-bone options like chicken wings usually provide juicier and more tender meat, as well as a better flavour. Best of all, they’re often much cheaper than boneless options so you can serve up your best food without breaking the bank! Whether you’re serving up BBQ beer chicken or pork chops with flair, try some cheaper cuts for a better barbie. A surefire way to save money on your next barbie is to reduce waste as much as possible. Instead of using disposable party plates and utensils, use reusable plates, cups, and cutlery. Not only will this make your party feel more welcoming, it means you’re not wasting money on stuff that’s only going to end up in the bin the next morning. And this rule goes for the food too. Be sure to cover and refrigerate any leftovers so you can finish them off later. After all, who wants to put in all that prep time only to dispose of half of your hard work? Just like with your burgers and your sides, you might want to consider making your very own marinade for all that meat. Making your own marinades, sauces, and dips will save you a ton over buying them ready-made in the supermarket. Apart from the financial benefits, of course, this is also a chance to make your very own signature sauce. Practise your recipe and build up your reputation amongst your mates as that one epic grill master. Look, we all know that BYOB means ‘save your host some money’ but getting your guests to bring their own booze has a ton of benefits for them too. BYOB allows guests to bring along the type of drinks that they actually like so nobody has to fear the dodgy, cheap six-pack all night. It means that guests who aren’t drinking alcohol get their needs catered for and, best of all, it’s a great way to bring everyone together. By bringing a drink, your guests get involved in making your party a barbie to remember, and asking a stranger what they brought along always makes a neat ice-breaker. And, of course, it bags you a cheeky saving too! Have you got any tips for an unforgettable BBQ that doesn’t bust your budget? Let us know in the comments section!